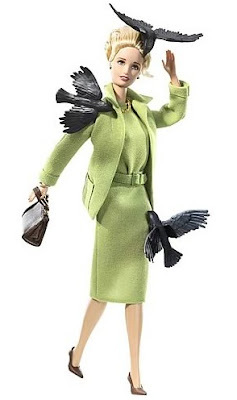 "The Birds" Barbie. Alfred Hitchcock would be pleased. I haven't actually seen the movie v.v The one time I had an opportunity to see it, my dad wanted me to help him bake some bread. It was very tasty bread, though. That is so so so so so so cool! When my friend told me about it, I didn't believe her! I mean stupid steriotypical barbie in a HORROR film????? I love it! He he... I live the movie "The Birds". Yeah, I haven't seen the film (yet) due to how my dad isn't into the genre and plus that, my siblings wouldn't be allowed to see it, and they watch basically everything I do. What's it about? I meant to say is: I love the movie "The Birds"
Hey I looked it up, there is going to be a remake. I bet the doll is publicity for the new movie. Kirsten, I'm really sorry I haven't been commenting that much lately. I just finished school and had a really hectic last couple of weeks. Unfortunately, I can only promise that this may be my last post in a week or so, as (provided the plan goes ahead without any hiccoughs) I will be leaving for business in Melbourne late this evening, and shall return Tuesday/Wednesday/Thursday depending on the state of aforementioned business. Anyway, I hope you're all exceedingly well, and enjoying your summer holidays. Keep a look out for my flute teacher! Haha. That was my attempt at mystery. xD You like? the birds are coming "and remember, the next scream could be yours"
How does she manage all that after a vicious birdy attack? Poor Tippi, i heard she was out for a week after that scene was filmed. I love it. This is incredibly funny, in my opinion. I think that so so cool. I have always been a Barbie fan. I sill am even though I dont play with them anymore. Maybe I will buy it to collect. I love the movie The Birds. I even own it on DVD. I got it last year for Christmas. Alfred Hitchcock films are some of the best films around. Ah, the Good Old Days . . .
My Condition Has Been Diagnosed!